Are you looking for ways to serve a large group of people while also saving money? Buffet catering might just be the thing. A variety of professional catering companies offer all-you-can-eat delights. They’re perfect for parties, weddings, business meetings, and more. You’ll be surprised how many benefits will come your way once you hire a caterer for your Detroit event. Buffet services are very popular because they decrease the chance of wasting food and money. One of the biggest problems when ordering catering is not knowing exactly what to get for certain guests. You may have an idea of what they like, but you could have one friend that follows a vegan diet and another who is a strict Paleo. Surely, you prefer to have meals that won’t end up being a wasted. Asking your caterer about a buffet option can get rid of that problem and offer a greater variety of foods to try. With a buffet service, you let your guests make the decisions so you don’t have to. If no one is talking during your event, then something is wrong. Sometimes events can get a little stale if your guests aren’t in a setting that encourages mingling. Buffets offer a way for people to strike up conversation while waiting in line, and meet new people. Additionally, buffets are usually casual, so you won’t have to worry about seating arrangements. Your friends will be drawn by who they want to meet up with and a buffet offers the perfect excuse to do so. If you are aiming for something more formal and organized, not to worry. 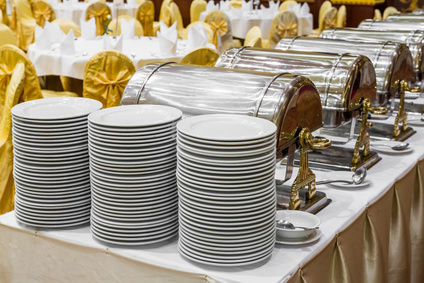 Buffets can still have an elegance to them that allows your guests to chat with others while they get food, then return to their seats when its time. It will require some strategy, but going back to the previous benefit, the planning will be in the seating rather than the food. Instead of purchasing a meal plan, the alternative is buying food in bulk. When you select the buffet option for your event, you can decrease the cost of the service without allowing your guests to starve. Buffets are perfect for hosts with a strict budget and an upcoming deadline. Discussing what food will be served with your caterer will help you ensure that the food selection is filling, yet inexpensive. The best and most obvious reason why buffets are perfect for events is the practically endless amount of food you and your guests get to enjoy. Once you discuss with your caterer how to organize the food and what selections are best, you can sit back and relax. The guests will be able to get seconds when they want, those with special diets can eat what they can, and you succeed as a fantastic host. If you’re hosting an event and need a Detroit buffet catering, contact David Graham Events for an estimate today.